One of the most famous national monuments of the country, the India Gate has become synonymous with Delhi! Located right in the heart of the city, the India Gate has attracted tourists from all over the country. The monument has been designed by Sir Edwin Lutyens, and is said to have been inspired by Arc de Triomphe. The foundation stone of the India Gate was laid by the Duke of Connaught in 1921. 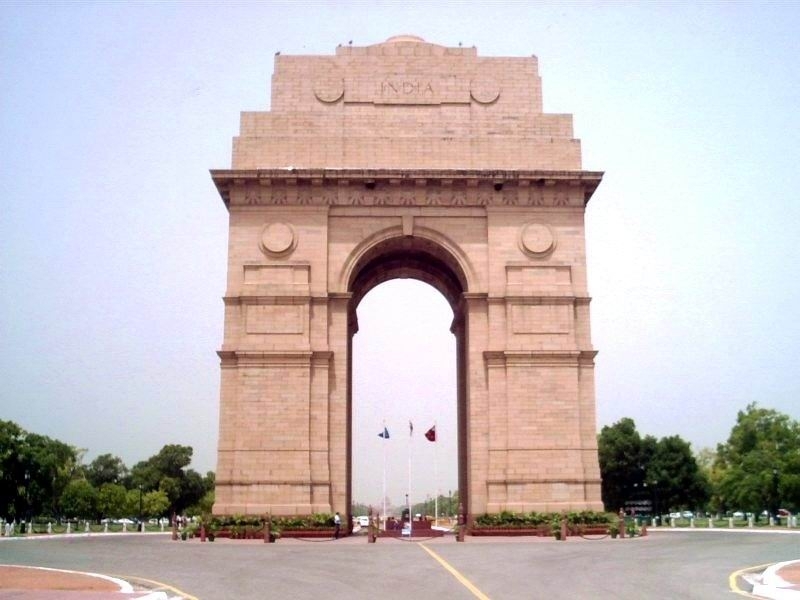 The India Gate was initially known as All India War Memorial and has always been a prominent landmark in the city. Believed to honor over ninety thousand British Indian Army soldiers, the India Gate is a beautiful monument made of granite and pale red sandstone. There are names of over 13516 Indian and British Soldiers on the memorial, these are the names of the soldiers who were killed in the North Western Frontier of the Afghan War. The India Gate also is known for the eternal flame that is known to burn night and day right under the arch; this flame burns to remind our nation of the numerous soldiers who had laid their lives during the 1971 Indo-Pak war. The statue of King George which currently is at the Coronation Park was once under the vacant canopy in front of the India Gate. This beautiful empty canopy too has been designed by Lutyens and it is believed to have been inspired by a pavilion from Mahabalipuram built during the 6th century. After India gained its independence, the site of the India gate is popularly known as the Amar Jawan Jyoti or the flame of the immortal solider as it is the site of the Indian Army’s Tomb of the Unknown Soldier. A Hexagon complex, which covers an area of 306,000 meter square, the India Gate, has a diameter of over 625 meters. The India Gate is located right in the city; it has been located in such a way that most of the famous and important roads of the city spread out from the location. During the evenings this monument is lit up giving it a rather beautiful look along with the beautifully structured lawns. The famous Republic Day Parade that starts from the Rashtrapati Bhavan passes through the India Gate. It is here that the parade stops for 2 minutes and holds silence for the martyred soldiers. Old Delhi Railway Station till during the 1920’s had served the entire city and during those days the Delhi Agra railways cut through the Lutyens Delhi and the current site of the India Gate. This route however was shifted to go through along the Yamuna River after which the construction of the memorial site began. The India Gate has become a great symbol of patriotism, numerous youngsters have gathered around the India Gate to conduct numerous peaceful protests. The beautiful manicured lush green lawns of the garden near the India Gate has attracted numerous of tourists and Delhietes alike, these gardens have been beautifully maintained like the magnificent monument of India Gate. Been to India Gate ? Share your experiences!